As it turns out, “Bigfoot” was a dinosaur–a giant, plant-eating one. A new study based on fossils excavated in Wyoming reveals the largest dinosaur foot ever found and identifies it as a brachiosaur, a type of sauropod dinosaur that was among the largest land animals on Earth. The work, published today in the journal PeerJ, also confirms that 150 million years ago brachiosaurs called a huge swath of North America home. “There are tracks and other incomplete skeletons from Australia and Argentina that seem to be from even bigger animals, but those gigantic skeletons were found without the feet. This beast was clearly one of the biggest that ever walked in North America,” said co-author Emanuel Tschopp, a Theodore Roosevelt Richard Gilder Graduate School postdoctoral fellow in the American Museum of Natural History’s Division of Paleontology and author on the new PeerJstudy. The foot was excavated in 1998 by an expedition team from the University of Kansas which included Anthony Maltese, now at the Rocky Mountain Dinosaur Resource Center in Woodland Park, Colorado. “It was immediately apparent that the foot, nearly a meter wide, was from an extremely large animal, so the specimen was nicknamed ‘Bigfoot,'” said Maltese, lead author of the study. 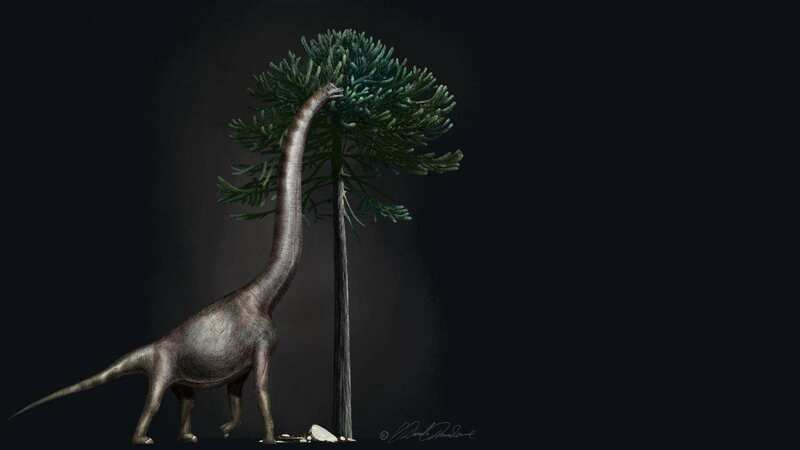 Now, after thorough preparation and examination, Maltese, Tschopp, and collaborators have identified the foot as belonging to an animal very closely related to the long-necked, long-tailed sauropod Brachiosaurus, best known as the sauropod featured in the movie Jurassic Park. The researchers used 3D scanning and detailed measurements to compare the specimen to feet from numerous dinosaur species. Their research confirms that this foot is the largest dinosaur foot discovered to date. The study also shows that brachiosaurs inhabited a huge area from eastern Utah to northwestern Wyoming. The rock outcrops that produced this fossil–the Black Hills region of Wyoming, famous today for tourist attractions like Deadwood and Mount Rushmore–hold many more fantastic dinosaur skeletons, says Maltese. The research team hopes to continue their studies on fossils from the Black Hills region.